Security Bike Patrol Service - is very proud of the fact that we were one of the first security firms in the State of Massachusetts to implement a bike patrol security force program– our bike patrol service has been in operation longer than all other security company’s and that of some law enforcement agencies. 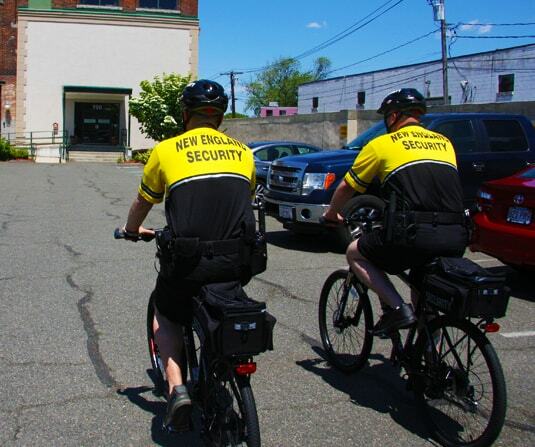 New England Security has the largest bike patrol division of any security company and services a wide variety of clients such as office buildings, business towers, shopping centers and construction sites . In order to offer the best service possible, New England Security has developed a comprehensive training and bike maintenance program – ensuring that all of our officers are properly trained and well equipped to perform their bike patrol duties in the safest and most effective manner. Deterrence: we’ll identify and deter criminal activity and unwanted behavior, insuring your location, building or facility is safe and secure so that all your property personnel, visitors and guests are safe at all times. 24/7 Communication: Communications is essential to our success. We are always available to respond to your needs or answer any questions that you may have. Cleaning and Graffiti Problems: a big part of a quality environment is how it looks. Our officers will provide you with an Facility Condition Report anytime they observe trash or graffiti or should you prefer they will have your maintenance staff remove it before you arrive the next day. Reports: we document every thing found on our patrols, including any observed problems or issues. We will photograph graffiti and share it with the police. All activity reports are kept on file. These are available upon request or at agreed-upon intervals.